In the previous article, I may have been overly specific in my attempt to clarify the features of the Nikon F4, thus the explanation might have been a bit technical. I do hope I've sufficiently summarized the background of the development of the F4 camera. Let's move on to the next Nikon camera : the Nikon F3. This camera is two generations behind the F5, but the F3 high-eyepoint is still in Nikon's product lineup (depending on the country or region). What are the reasons that the F3 has remained popular for so long --- even longer than the very first Nikon F? In this issue, let us retrace the history of the Nikon F3. The Nikon F5 was introduced on Oct. 30th, 1996. Even after 2 years, its high performance is still attracting people. Together with the F5, the F3 --- introduced in Mar. of 1980 --- is still on the market. Even with high production costs and problems such as the securing of inventories of spare parts, Nikon Corporation has no plans to stop selling the F3 high-eyepoint (depending on the country or region). There are few cameras that boast manual focusing (MF), manual film advance and "light weight" uncharacteristic of an SLR, but there may be other factors that have contributed to the ongoing popularity of the F3. It was born with a considerable number of cutting-edge technologies and features. The Nikon F2 was introduced in Sep. of 1971, and it has enjoyed a degree of success rivaling that of its predecessor. However, some critics said that the new model represented only "conservative improvements" (although it was actually a full-scale model change --- we'll discuss that in the next issue). Hence, the Development Section decided to show a "significant improvement" in the next model, the Nikon F3. The development of the F3 began with a question regarding the electronically controlled focal-plane shutter, which was the latest technology at that time --- "How can we make use of the electronically controlled shutter to simplify the use of the camera and its functions ?". The two(2) advantages of the electronically controlled shutter are 1) automatic exposure (AE), and 2) its ability to hold an accurate long-time exposure. There were practically no requests made to include the automatic exposure function in the F2. In spite of this, Nippon Kogaku K.K. (now known as Nikon Corporation) planned to incorporate the automatic exposure (AE) function by the electronically controlled shutter into the F3. It was quite obvious that the automatic exposure function would not be welcomed initially. However, this was based on the assumption that, in the future, automatic exposure would become a significant factor even in profesionally oriented SLR cameras. The Nikon F2 Series has already tried to incorporate automatic exposure and accurate long-time exposure by adopting 1) the "EE Control Unit" Series, which enables shutter-priority AE, and 2) mechanical long-time exposure using the self-timer. These two(2) features were also adopted by the Nikon F3. Also, since F Series cameras rely rather heavily on the external motor drive, the shutter movement and film advance should be done electronically instead of mechanically. This ensures more accurate camera operation. 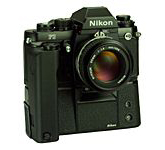 The Nikkormat(Nikomat) EL, an earlier AE SLR released in 1972 (one year following the debut of the Nikon F2), also adopted the electronically controlled shutter. Electronic control of SLR camera shutters has become the norm rather than the exception. The F3, however, did not include electronic shutter control in order to follow the trend. This feature had been slated to be part of the camera from early in the F3's development. Following the completion of the initial plan, the actual development of the F3 started in 1973. It kept the interchangeable viewfinder, which was also used in the F2 . It also adopted new technologies, like the electronically controlled focal-plane shutter, as standard features. As with the F2, the TTL and the AE circuit were incorporated into the interchangeable Photomic viewfinder. The electronically controlled shutter, a breakthrough in camera technology, took some time to develop due to the simultaneous development of the electromagnetic shutter release system. This system, released later, disables the camera --- even during shooting --- when the battery has fully discharged. This might have been a better solution to the above problem. Anyway, almost all of the problems were solved --- including those in the AE circuits --- and the "F3 Photomic AE" (a name which might have been used if released) camera was about to be released as a Nikon product. This was considered to be a reasonable successor to the F2. It was solid, practical, and well conceived. But it was never released. A dream comes true : The pin-hole mirror"
The Nikon F and F2's interchangeable Photomic viewfinder with its built-in exposure meter could be improved accordingly as technology advanced. But TTL metering cannot be performed with viewfinders that lack a built-in exposure meter (e.g. Waist-level finder, Action finder, etc.). Nippon Kogaku K.K. was not to able to explain this problem, but the Engineering and Development Group was working on a new technology. Instead of metering from the viewfinder, they worked on a way to perform TTL metering from the camera body ("camera body metering"). There were similar technologies available, but some caused the viewfinder to darken, while others shaded the field of vision. There was also a problem with the actual metering function. A new idea was necessary. Then, after years of research, a pin-hole mirror was developed. 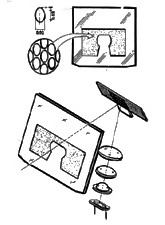 On the reflecting side of the reflex mirror, there are number of pin holes, and the light that passes through the holes goes to the metering sensor. By changing the placement of the holes, the metering function becomes fairly flexible and there's no problem with the viewfinder's visibility. Also, the light is lead by the sub-mirror to the bottom of the camera's mirror box and is then collected at the sensor through the condenser lens. This sub-mirror is a unique feature which condenses and expands light. The design enables TTL flash control using the sensor. Now a common feature, TTL flash control was developed to control the light from the speedlight so that an adequate amount of light can pass through the shooting lens to the film. The viewfinder can be made smaller by employing camera body metering via the pin-hole mirror. Body metering technology resulted in a decrease in size and weight from the Nikon F2. Thanks to this idea, many of the camera parts --- both outside and inside --- became smaller and lighter. Since this idea took shape, mechanical efficiency, optimization and downsizing have become predominant themes. Nikon's primary hope for the F3 was that it operate smoothly. However, since the TTL metering and the AE circuit were moved to the camera body from the viewfinder area, a high-density mounting became necessary. This presented yet another big technological challenge. The entire plan was renewed and development restarted in 1976. After battling through hardships, a test model was finally completed, with great improvement in the functions. The pin-hole mirror F3 was finally ready to be shown to the public. Obviously, Nippon Kogaku K.K. did not base its target of engineering and development on the camera developed at that time. It had plans for future cameras as well. There were several technologies being discovered around that time --- Electromagnetic shutter release, Quartz shutter control, and Liquid Crystal Display(LCD). If these technologies were incorporated in the development of a camera, they would further improve its quality and ease of use, as well as lead to other new developments. The development plan was revised to include all of these new technologies. This was a tough decision for the leader of the development team to make, as it represented a restart of the entire project. There was another incident that triggered this revision --- the introduction to Nippon Kogaku K.K. of a world famous industrial designer, Girogetto GIUGIARO (1938 ~ ). A renowned journalist / photographer specializing in automobile critique introduced Mr. GIUGIARO to Nippon Kogaku K.K. because he thought that "An international product like a Nikon camera should have an international design." Mr. GIUGIARO did not disappoint. With a holding grip in the front camera body, a synchronizing figure between the external motor drive and the camera body, and other radical ideas, it was quite obvious that a new electronic camera had been born. The final revision neared completion in late 1977, with new functions and a new design. Occurring parallel to this revision was the development of an F3 for NASA (National Aeronautics and Space Administration), but we'll save this discussion for another time. In the beginning, the F3 test model was "an F2 with an electronically controlled shutter". Through numerous revisions, though, significant progress was made from the F2. In March of 1980, "the camera of the `70s" was succeeded by "the camera of the `80s", and the Nikon F3 received favorable reviews. The accurate exposure measurement by the pin-hole mirror, the high-speed, long-lasting motor drive and other functions received high praise. Other features such as LCD, which set the standard for cameras, and the hand grip, which became a Nikon camera standard were also popular. It also reinforced the view that high-class cameras should have a style and design that express the things they can do. In the Nikon F3, you can sense "fashion" and "spontaneity" --- a considerable change from previous Nikon cameras which embodied "tradition", "precision" and "dominance". The F3 represents an improvement in basic functions and an emphasis on technology, and possesses characteristics not found in other Nikon cameras. In the development of the F3, many engineers not only thought of remodeling and improving the Nikon F2, but also they had their own thoughts and ideas in developing this camera. Perhaps that is why the concept behind this camera was unlike anything preceding it. If there were new technologies being introduced, they would replace the old ones --- even during development. These new ideas and technologies all came together to create a special camera that is popular even today. In my opinion, the idea of "developing a camera based on the self righteousness and self interest of the engineers" might be one thing Nikon's Camera Section should work to avoid. Despite this, the Nikon F --- even more so than the F3 --- was developed based on the beliefs of its engineers and became an extremely popular, long-selling product. The story of the F3 illustrates the difficulty in meeting the expectations of consumers.